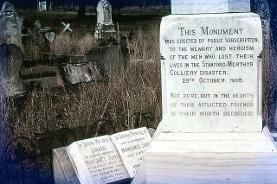 On Sunday October 29 1905, a huge fire of unknown origin set off several explosions in the Stanford Merthyr Colliery. Henry John Adams, the director of the East Greta Coal Mining Company heard about the first explosion, and came directly to the site to help. He and others decided to wall off tunnel No. 1 with bricks. During this task another explosion occurred which killed Adams and wounded others. The pit shut down for months after the explosion, leaving many without work; an estimated thousand people were affected. The Sydney Morning Herald reported that while some people were able to get work at nearby collieries, many left town in search of work. 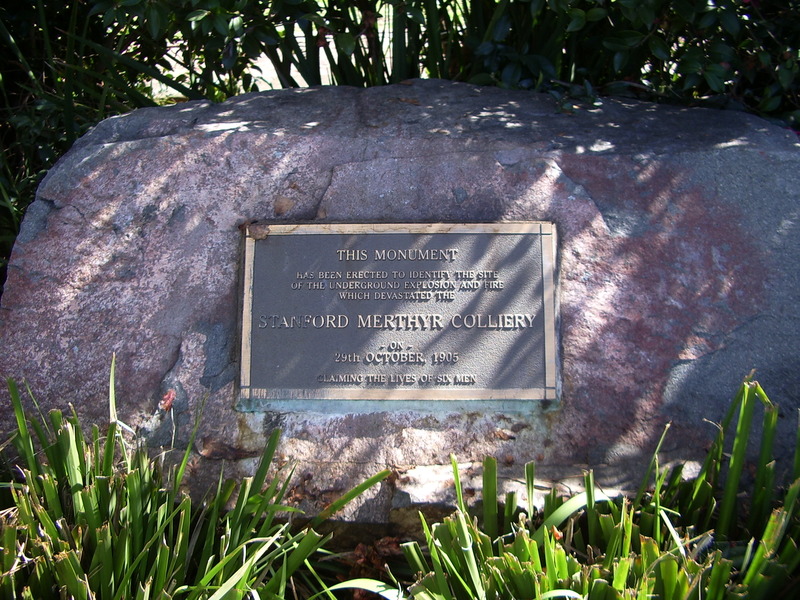 Stanford Merthyr Colliery Disaster Memorial, Stanford Merthyr. Taken by Jack Keily. From the Keily family collection, University of Newcastle, Cultural Collections. Stanford Merthyr Monument, Hunter Valley Coal series - Kurri Cemetery. From the Dr.John Turner collection, University of Newcastle, Cultural Collections. "STANFORD-MERTHYR COLLIERY DISASTER." Australian Town and Country Journal (NSW : 1870 - 1907) 1 Nov 1905: 16. Web. 12 Jun 2013 <http://nla.gov.au/nla.news-article71536483>. "STANFORD-MERTHYR DISASTER." The Sydney Morning Herald (NSW : 1842 - 1954) 3 Nov 1905: 7. Web. 12 Jun 2013 <http://nla.gov.au/nla.news-article14744672>. "STANFORD-MERTHYR COLLIERY." The Sydney Morning Herald (NSW : 1842 - 1954) 6 Nov 1905: 6. Web. 12 Jun 2013 <http://nla.gov.au/nla.news-article14719501>.